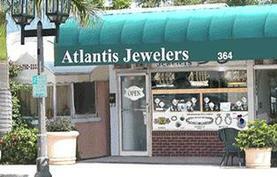 Atlantis Jewelers is a family owned and operated full service jeweler serving South Florida since 1989 and has built an outstanding reputation for quality, value, impeccable service and integrity. Atlantis offers a luxury destination for fine jewelry offering personalized service, distinctive and unique design, and a vast selection of diamonds and fine jewelry. To meet our client's needs, we provide meticulous repairs, appraisals, gold and estate buying, and custom design services. Our experienced staff and Graduate Gemologist are committed to providing the best in quality service and value.